Merry Christmas a little late! A month and a half ago Aubryn, Rylan, Reagan, and James sang the second verse of "The Holy Ghost" in our children's Primary Program at church. We practiced A LOT. Brad learned the song on the piano and would play for them. Before that, I had them sing along with the computer. Reagan liked rapping the song. I love my kids! They worked hard on this. I am not musical in anyway, so they figured a lot of this out on their own. This was taken about a month ago. She is so fun and bright! Follow this LINK to see lots of photos. I often write the silly things the little kiddos do, but wanted to take a moment to recognize the good that Brad has been up to. - grew a garden this summer and won 2nd and 3rd place in the Utah State Fair for his potatoes and tomatoes. -Is on the Student Response Team. - Passed off every single hymn in the LDS hymn book. That means he can play every hymn well enough to be sung to. He plays regularly in Seminary. He recently has taken up the organ and plays the prelude in Sacrament Meeting. I don't think it will be too long and he will play during the meeting as well. He found a free organ in the classifieds. It was in our town! He moved his desk out of his room and made room for it. He LOVES it! 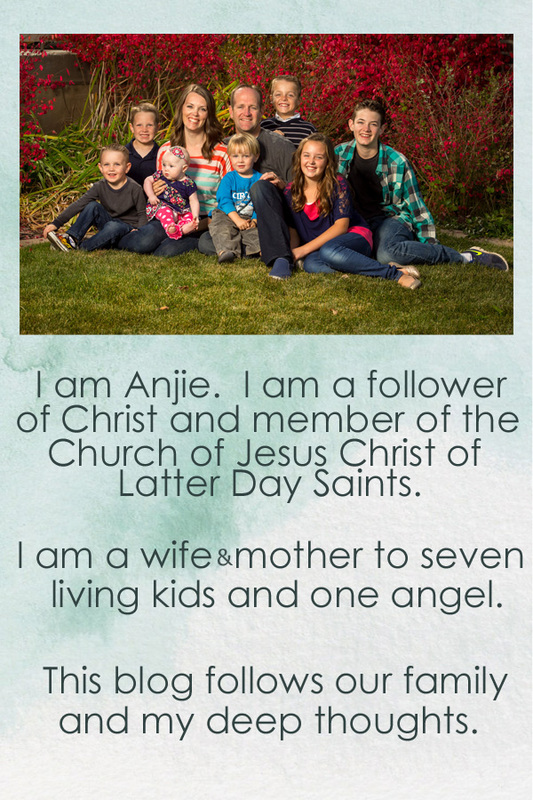 -He loves family history and has prepared 15 couples to be sealed for Brian and I's 17th wedding anniversary. He also has a stack of names for me to take to the temple. -He has received two palms after his eagle scout award. -And, he made dinner tonight! 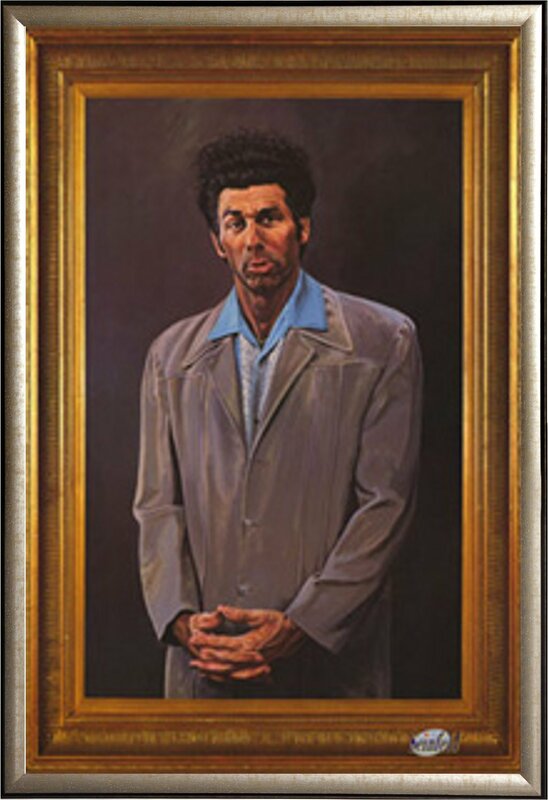 While shopping with Brad last week we walked by a painting of Kramer. Brad asked me, "Who's that?" 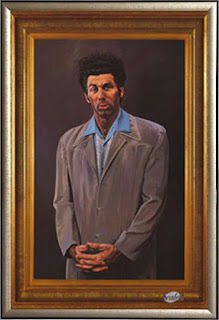 "Kramer! From Seinfeld." I responded. Last week I ran into Home Depot to grab something. (hanger to hang 100lbs. into brick) I knew exactly what it was, but couldn't find it. I wandered around looking. Then I wandered around looking for someone to help me find it. He took me all they way to the other side of the store to the command hooks. I said , "This is not it." He said, "Well, this is what we have." I wandered around looking for someone else to help me. He took me all the way back to the other side of the store to the screws. I said, "This is not it." So, I called home and asked for Brad. He looked it up online. Told me the isle number and the bin number. I walked right to it! 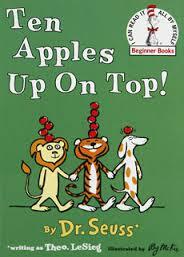 We were reading books before bed one night and Eden was enjoying, "Ten Apples Up On Top." She kept saying, "Apple. Apple. Apple." I would have to repeat it back to her each time. Later that night I went in to check on her before I went to sleep. She was sound asleep and she said, "Apple. Apple." James was holding the baby Jesus from the Nativity. 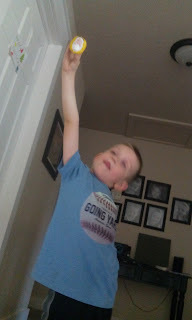 He was reaching as high as he could, holding baby Jesus up towards the ceiling. 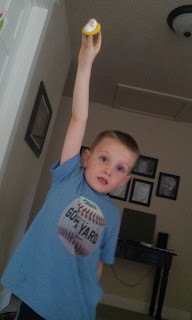 He told me, "I'm holding baby Jesus up high for him to see what he looked like as a baby." Every time we pray, EVERY TIME, Wesley insists that you, "Bless Wesley to feel better." As soon as anyone begins to pray is says it over and over until they say it loud enough for him to hear it over his talking. Then he is happy and content. There have been tears shed if he thinks you did not say it or you forgot. We have been working hard on Reagan's reading. We almost switched schools, like, he was dressed and ready to go to the new school and two minutes before he would have left I couldn't do it. One of the things we have been doing is called Super Speed. It is a game/ exercise that he and Rylan do together. They usually fight more than they don't, but it still seems to be working. Maybe they will learn to work together too. A couple weeks ago they were both able to read the 100 most common words read in the English language in under a minute! Such a great accomplishment. I know they still need to improve, but this was a huge accomplishment! Disappointingly, it didn't go well. I was trying to cut some fabric and just couldn't get the dang thing to work. Eden woke up at 1:00. Three sad, precious hours ruined and gone. I felt like crying. I peeled the fabric off of the mat and cut it out with my scissors! Brad was like, "Did you plug it in? Did you turn it on?" Um, yes. And watched about ten youtube videos trying to trouble shoot it. I cut it out and finished my project. 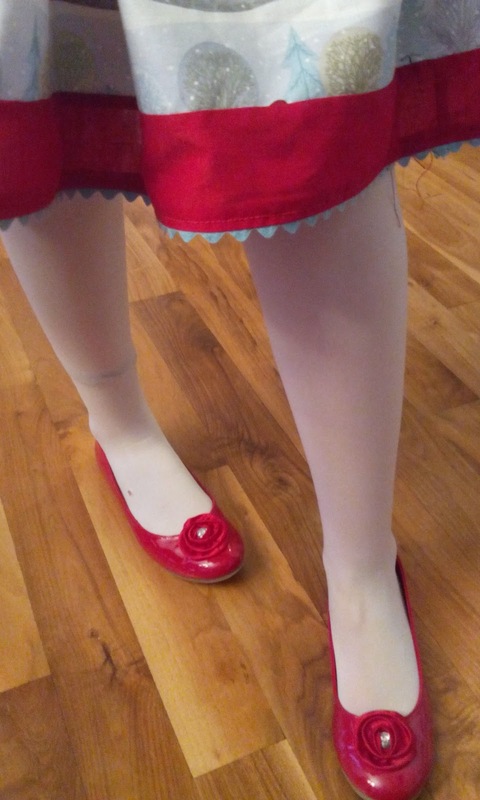 I sewed Aubryn a cute (or so I thought) Christmas outfit. She is singing in a concert tomorrow and I was trying to finish it so she could wear it. After it was all finished, I had her try it on. She looked less than thrilled. I asked what was wrong. 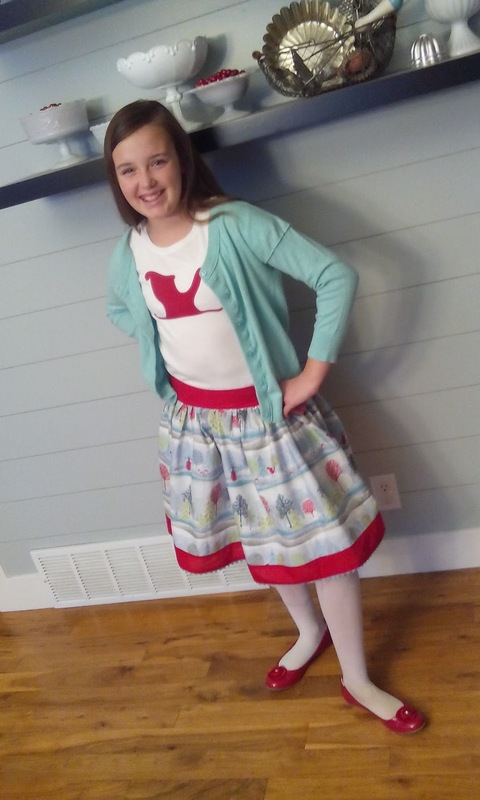 She said quietly, "I look like a Christmas geek." I told her she didn't have to wear it. Eden has a matching skirt too. I thought she would be so excited. Maybe when you are eleven, that novelty begins to wear off. Kids were home and it was homework time. Thursdays are extra special because I get to loose my mind going over spelling words with three kids who spell as well as I do, which isn't great. gnat, knot, wrap, wrote, gnaw, know, are a sampling of Reagan's words today. How does this language make any sense? We finished homework and spelling. Didn't do reading exercises. Didn't get Reagan's reading done. Didn't get Reagan's paper written. It was dinner time and there was no dinner. I had scouts. I also was looking forward to meeting up with some friends after scouts. I ran out the door with a slice of pizza in my hand. As I hustled past the Bishop's office he was standing in the hallway! He's never there on Thursdays. Must have been doing tithing settlement. The one time I walk into the church eating pizza like a frazzled Akela running down the hall to scouts. "Hi!" I said with my mouth full of cheese and bread. "Running late." I added with a half smile trying to save face. I finished scouts early and was so excited to get to my friends when a mom called with two other boys who were coming "late". So we did it all again. all. again. When I got home I was pulled into a few more things and by the time I typed the address into google maps to navigate, it was too late. It would take me 24 minutes to get there and they were leaving in 30 minutes. I sadly took off my coat, hung it up in the coat room, and set down the keys. Wesley got out of bed. I started to walk him back to his bed, but stopped and decided to rock him like the old days. He cuddled right into me. I sang him our song. It was a sweet moment. Then James yelled at the top of his lungs from his bed, "I want some bologna!!!"